Greetings from Jungle Music Palms and Cycads in Encinitas, CA. Below is a short article on one of the most common difficulties people have in creating a beautiful garden in their locality. It presents the most common pitfalls and mistakes that people make. Hopefully this article will help guide you to creating your beautiful tropical garden. Having a nursery for almost forty years, it has long been apparent to me that many people who want to create a lush and beautiful garden don't really have any idea of which species of plants to select for their garden. Sure, there are some self-educated enthusiasts who have studied up and arrive at our nursery knowing exactly what they want. But, by far, the majority of people need some guidance and have no idea which species will survive for them and give them the tropical look that they seek. They need advice as to which species will survive in their area and which species they really like the most. And, they need to know the cultural requirements of these species. They often have the concept that they'd like their yard to "look like Hawaii", but have no idea where to begin and what species to select. Unfortunately, not everything will grow everywhere. One has to know what specific plants to select for their area. Mother Nature designed it that way. As an example, I get calls weekly from people who would like to grow the Red Sealing Wax Palm here in Southern California. This is not possible in our locality and would require a garden in the warmest area of the tropics. Southern California just gets too cold for this species. Limitations of what one can grow are typically based on weather characteristics; each given area can support certain species and not others. Limiting factors include such things as cold experience during the winter, maximal heat during the summer, air humidity and intensity of sun. Selecting the right species of palms, cycads or tropical plants can be challenging. Hopefully we can help you with some palm ideas. An overly cold winter can be a devastating thing to the garden of those who didn't research the best species for their locality. And, such losses might incorrectly lead a person to the assumption that "everything dies" in their garden. This is not the case. They have either chosen the wrong species to grow or have not been informed about the cultural requirements of the plants they did purchase. Staff at home improvement stores are famous for not knowing much about the species of plants they sell. Some customers inappropriately assume if the store sells it, it must grow "here". Unfortunately, many times this is not the case. In our area in Southern California, such stores sell Coconut Palms by the thousands and 99% of these are dead by the first winter. The same could be said for a shade loving palm placed incorrectly in full sun with a subsequent rapid decline. The customer either didn't receive or didn't follow proper advice. People also assume that any palm will grow indoors. But, there are certain species commonly sold as "house plants" that are near impossible to grow inside. And yet they are sold as houseplants. All of these failures result from not being told which species to grow in a given area and not getting appropriate cultural advice. To solve the problem of what to grow and how to grow them, one either has to do a lot of research himself or get help from an expert. 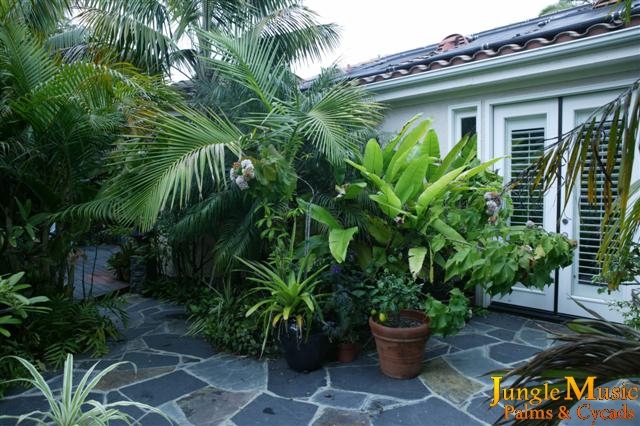 Palms, cycads and other tropical plants are the mainstays of creating a lush, tropical garden. But, you must know what species to select! There are literally thousands of different species of these plants and all have their own specific growth requirements. And, each of these different species have different cultural requirements. Of all the factors involved, winter's cold is by far the most important thing to consider. Plants are quite predictable in their cold tolerance. I would refer people to our Cold Hardy Palm article at this site for information on cold tolerance. At a certain temperature the plant fails to thrive ans starts to look bad. At a lower temperature it dies. These occurrences are fairly predictable. 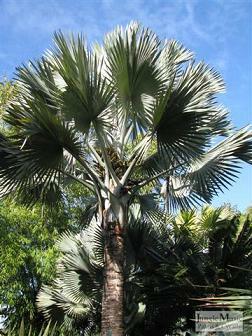 Nurserymen in the business of growing many palm and cycad species have come to understand the cold tolerance of all the species they offer. Next are the other cultural factors such as sun or shade, air humidity, drainage, etc. To accomplish success, a consumer must either learn these things as well through many hours of research or count on a nurserymen to give him good advice. He should be offered and understand a list of species he can grow. He must then decide which of these species he likes. And finally, for the species he selected he must receive accurate cultural advice. It is literally that simple: Know what speciesw one could grow and how to grow each of them. It's the same whether you're starting a brand new garden or just adding a few species here and there in the garden. It is possible to create a palette of plants that you like and have success with them. All that is needed is guidance. Many people think the best way to solve this problem is to hire a designer or landscape architect to help with design issues and selection of species. Sometimes such an approach can assist you but often it doesn't really give you the pallet of choices you seek. Alternatively, one an rely upon the advice of an experienced friend and get additional assistance from books and the Internet. Yes, these approaches can help guide you. But, this takes a lot of time and there is a better way. That is to get advice from people who know and actually grow tens of thousands of palms, cycads or tropical plants. Who else knows what does better in an area than someone who is actually growing them? They have the knowledge and experience to guide their clients. Our staff at Jungle Music combined has literally had well over 100 years of experience in not only growing the plants but also with helping customers achieve their goals. We've been in business since 1977 and have grown almost any species possible in Southern California. Yes, we've tried about everything and know from experiencde what doesn't do well here. And, you can benefit from our vast experience. Daily we share our experience, ideas and advice with customers. And, we have compiled a lot of data to help our customers achieve maximal success. There are several ways we offer help to customers regarding which species of palms or cycads would do well in their area. 1. If you are a "do it myself person", you can review the wealth of information at this site, either on palms, cycads or tropical plants. At this Site we have about a hundred articles on the plants and their culture. There are also about ten thousand photographs. Or, consider below a more time efficient way to solve your search - read below. 2. We have a free consultative service for serious customers who come to our nursery. Most find this very efficient, time saving and rewarding. After you get here, we sit down and discuss youor growing environment and what you are trying to Accomplish. Typically we look at dozens of photographs from an assortment of reference books and sites, and help you come up with good landscape design ideas that give you the exact look you are trying to create with the perfectly chosen species. If you wish, bring photos of your yard. From our years of experience with the species, we also will explain to you cultural conditions needed, growth rates, and each species ability to survive in your area. Many people are concerned about mature plant heights. We are experts on that as well. We also know growth rates of the species and have individual experience with all of them. This is a popular service we offer because enthusiasts get to pick the exact species they like, know how to grow them and at the same time pick out their favoite plants for their garden right then and there. 3. For those who feel it's necessary, we offer local on site consultations. A staff member actually comes to your home, inspects your site and offers suggestions on species that he thinks would work well for you. He can envision would would do best in your garden and look the best. There is a charge for this service and we usually reserve this for customers close to our locality. 4. For mail order customers, contact us by phone or email. Perhaps we can give you some ideas of species that would do well in your area. We ship plants almost everyday to all parts of the country and probably have an excellent idea of what species have a chance in your area. This applies to houseplants as well. There are very few specialty palm and cycad nurseries in the country. We feel that our assistance is valuable to everyone. On a re3gular basis we actually advise botanical gardens, landscape architects, designers and major landscape companies. They consider us the authority on tropical plants. So, whether you like cold hardy palms or exotic tropical type cycads, we can offer information for you and your garden. Most garden enthusiasts, when adding to or creating a new tropical landscape, need assistance in selecting the right species for their area. And, they need help on the culture of the plants they purchase. One can spend a lot of time and more importantly money getting professional help through landscape architects or design consultants. We feel our nursery offers the same assitance with more experience than most consultants and also typically for free. We have over a hundred years combined experience with the plants and can assist almost anyone achieve their goal of a lush and tropical garden. And, it's not that difficult. We explain choices and teach the customers how to grow the plants. Once a pallet of plants is decided upon, right then and there a customer can select and purchase his plants before he forgets what he just learned. And, even months or years later, we are available for continual assistance on the plants and their culture.